Dubai: Quick transportation to hospital and an early medical intervention can make the difference between life and death in the case of a heart attack, a heart specialist told Gulf News. Dr Brajesh Mittal was speaking on the sidelines of a cardiovascular disease conference Scaleheart 2016, held in association with Emirates Cardiac Society at the Conrad Hotel in Dubai today. 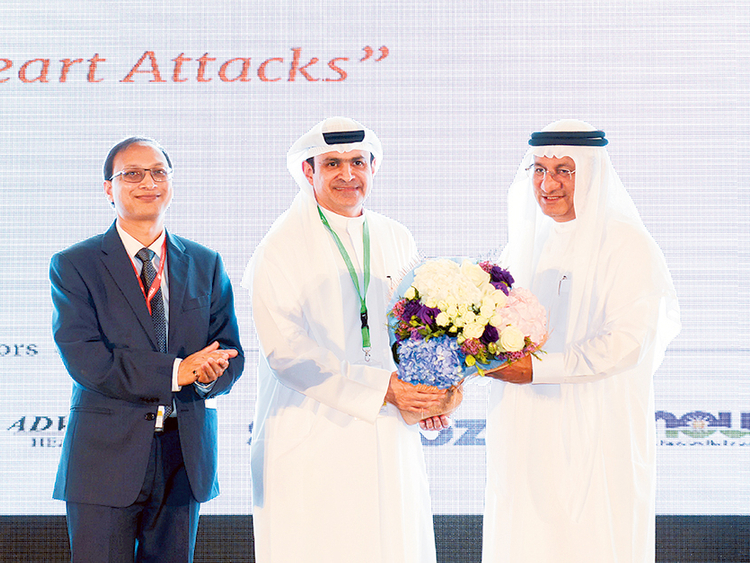 The conference, attended by leading medical experts from the UAE, focused on STEMI care, an acronym for acute heart attack due to ‘ST Elevation during Myocardial Infarction,’ sought to educate health care professionals on the importance of timely and urgent medical intervention during a heart attack. “A patient who experiences an acute heart attack — which means total occlusion [blockage] of an artery — needs to be immediately transported via ambulance to a hospital emergency where a cardiac surgeon can give him defibrillation and a clot-busting medication or perform a catheterisation to remove the block,” said Dr Mittal. “The urgency in reaching the patient to hospital is to prevent the heart muscle from deteriorating or dying due to complete lack of blood supply and also in many cases, averting sudden cardiac death as such electrical disturbances in the heart can be fatal,” said Dr Mittal, the founder chairman of Scale Foundation, which is organising the conference. Dr Mittal is an interventional cardiologist and Head of Cardiology Department at Garhoud Private Hospital, Dubai. According to figures of the World Health Organisation, more people worldwide die of heart diseases (most common being myocardial infarctions or heart attacks) yearly than any other cause. In 2004, 17.4 million deaths occurred due to cardiovascular disease; this figure is predicted to rise to 23.6 million by 2030. Dr Mittal added that although the incidence of Ac Mi (acute myocardial infarction) and deaths due to Ac Mi are declining in the West, it is still high in this part of the world. “The medical protocol for a heart attack is in place," he said. "but people are not aware that they should never drive themselves to the hospital, instead one should call for an ambulance. The paramedics can give first aid such as defibrillation or electric shock to prevent cardiac arrest and rush a patient to the hospital. 1. Go in for regular cardiac screening. 2. If you have more than one lifestyle disease such as high cholesterol, high blood pressure or diabetes, make sure to have all the preventive screening tests carried out at regular intervals to maintain heart health. 3. Those who have a genetic predisposition are also advised regular cardiac health screening. 4. Cut back on processed foods, have a nutritionally balanced diet and have at least 30 minutes of physical activity each day like walking or gym workout. 5. Take an aspirin each day if you have a predisposition to heart disease. 6. If you have chest pain, have aspirin or nitrate by placing it under your tongue. 7. If the chest pain is severe, do not wait, dial 999 and call for an ambulance, as the earlier you reach the hospital the better. Do not attempt to drive yourself to hospital as this can prove fatal.